Sewer line issues are some of the more stressful problems a homeowner will ever encounter. No one likes to be without indoor plumbing, and yet all too frequently the warnings signs are ignored due to simple ignorance. The more you can learn about how your sewer line works, warning signs to watch out for and preventative maintenance measures, the less likely you will ever be in a situation where your Annapolis area home needs costly plumbing repairs. 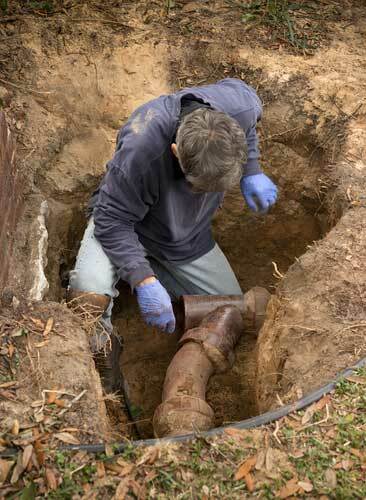 In this post, learn about three common signs that your sewer line is in need of repair. Here, it can be helpful to understand more about the parts of your home’s sewer system that you can’t see because they are underneath the house itself. Basically you have a central plumbing line that serves as a main conduit out of your home. There are a number of smaller lines that lead from the various appliances, including your toilets and sinks. At some point, usually near or at the curb, your personal home’s sewer line links up with the sewer line for your township or city sewer system. At this point, any clog or blockage or any other repair issue is usually a matter for the governing body rather than you as a homeowner. By moving quickly to address any issues present in “your” part of the sewer line, you can avoid any liability for larger sewer line issues that may otherwise develop and affect other homeowners in your neighborhood as well. The following three signs are some of the most common symptoms to look for that indicate your sewer line may be in need of repairs. The goal in identifying these symptoms is to avoid ever having to face a full-scale sewer line blockage. Sign #1. Your home and the area surrounding it smells awful. If you live in an area with lots of old or large trees, tree roots that intersect with sewer lines will likely be an issue at some point. If a root or some other obstacle has caused a crack or break in the sewer line, your sense of smell will likely be the first of your senses to notice it. The smell itself is most likely to resemble rotted food or eggs, a sour or stale “cold” odor or a musty smell similar to mildew and mold or even wet decaying grass. You may find it smells like “underground,” which is exactly where it is coming from. You may smell the odor only outdoors or inside your house. If it is inside the Annapolis residence, it will likely be stronger around your plumbing-connected fixtures and nearer to the floor. When you hear odd noises (clanking, grumbling, gurgling) combined with a bad smell, you can be even more certain there may be a compromised plumbing line that is leaking. A symptom of a more serious brewing issue is when you find a bad smell combined with some mysteriously wet or damp areas in the lawn around your home’s premises. This can indicate a sewer line is leaking toxic material out into your yard. If you see pests such as insects or rodents gravitating towards these areas, it is even more likely that sewage waste is being leaked into your lawn. Sign #2. Your toilets, sinks, and tubs begin to gurgle, drain slowly or clog up. Toilets that gurgle or sweat, sinks that drain slowly or tubs that are easily clogged up even when no obvious clogs are present are all tell tale symptoms that a plumbing line issue may be brewing beneath your home. If you notice your fixtures interacting with one another (for example, if your toilet gurgles while your washing machine drains), this is an even more certain sign that there may be a plumbing line issue. Another common related symptom is having a toilet start backing up after it has been working just fine and you can’t find any sign of the reason why. Sometimes auguring it will help, but if there is a bigger sewer line issue at work, auguring will likely offer you a temporary fix for the next few flushes and then the problem will come right back. Sign #3. The water level in your toilet changes for no apparent reason. A particularly easy symptom for most homeowners to notice is when the water in the bowl of your toilets starts to fluctuate up or down without notice. You may notice that the water level becomes oddly low or even that the bowl seems to drain out entirely after a flush. Or you may notice that the water level stays higher after a flush than what you are used to. If your toilets or other fixtures begin humming, gurgling, sweating (when condensation forms on the outside of your toilet’s tank) or grumbling, this just adds evidence to the case that you may have a sewer line issue brewing. If your toilet ever overflows for no discernible reason, this could also indicate a major water level fluctuation rather than a particular blockage. As well, if the water in your toilet changes colors, seems to “run” all the time (as if the flush never quite finishes its cycle) or can be seen to be dripping down the side of the bowl, this too can be a sign of a sewer line issue. By understanding some of the most common warning signs of an impending sewer line problem, you can take action right away to identify the source of the problem and remedy it. By taking action promptly, you can save yourself time and money and save your family the hardship of dealing with a broken sewer line. Here, it can also be a wise idea to develop a relationship with a trusted local plumbing company and schedule at least an annual maintenance checkup to be sure no larger plumbing issues are developing. 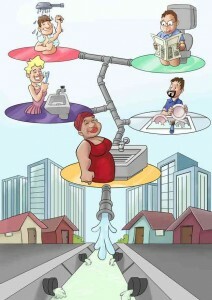 For quality plumbing services in your city or home, call Heidler, Inc at (410) 268-7191 in Annapolis, MD.